Details: Details: United Financial CU Freeland Walleye Fest 5K/10K 2018 Overview United Financial Credit Union is proud to present the 9th Annual Freeland Walleye Festival Race for 2018! Join several hundred participants in running and/or walking USATF sanctioned 10k and 5k Freeland Rail Trail/road courses. Or run along with the kids on a 1 Mile trail fun run course. 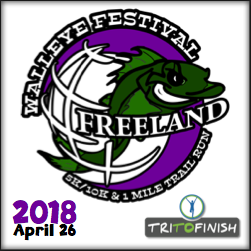 The Walleye Fest race is returning to the Freeland SportZone this year! A portion of proceeds from this race go to benefitting the Freeland Lions Club. We will be racing on a Thursday night with all adult participants receiving one free weekend entry to the Fish Tent when showing their race bib! This race is being organized as part of the 33rd annual Freeland Walleye Festival through a joint effort between United Financial Credit Union, TriToFinish, Walleye Festival Organizers and Tittabawassee Township with proceeds being placed back into the Freeland community through the Freeland Lions Club, a 501c3 charitable organization. Course Description: All races will begin on Stone Briar Lane in the neighborhood behind Freeland SportZone where runners will proceed to Kochville Rd. Then... 5K Course Runners will take a left on Kochville Rd and proceed to the Freeland Rail Trail before turning right (North) onto the trail and running approximately 1 mile before turning at Muirhead Rd and following it around and back onto the trail and again turning right (North). A very short time later, runners will turn around at McDonald Ford and head back toward Freeland Sportzone. After passing Kochville Rd, runners will turn with the rail trail just before arriving at SportsZone where the trail will take them behind the building and to the finish line near the tennis courts and pavilion. 10K Course Runners will take a right onto Kochville Rd and head East before turning left (North) onto Garfield Rd. They will then run one mile before turning left onto Pierce Rd. About 1 mile later, runners will turn right onto the Freeland Rail Trail and will head North on the trail until reaching Powley Dr and turning right. After running East for about ¼ mile, runners will turn around and return to the Freeland Rail Trail; turning left and head back toward Freeland SportZone via the Rail Trail. After passing Kochville Rd, runners will turn with the rail trail just before arriving at SportsZone where the trail will take them behind the building and to the finish line near the tennis courts and pavilion. Packet Pickup and Late Registration: Wednesday, April 25th, 2018 from 5:00-7:00 pm at the Freeland Branch  United Financial Credit Union, 7600 Midland Rd, in the Pats Grocery Complex Thursday, April 26th, 2018 from 4:00-5:45 pm at Freeland SportsZone. Race Start Times 10K Race will begin at 6:00PM 5K Run/Walk will begin at 6:30PM 1 Mile Fun Run will begin at 7:15PM Awards OVERALL AWARDS Awards will be provided 3 deep to overall male and female winners of the 5K and 10K events. In addition overall winners will receive free entry to next years Walleye Festival Event in the category they win. 2nd Place overall finishers will receive 50% off and 3rd Place overall finishers will receive 25% off entry to the 2018 event. NOTE: All participants will receive high quality finisher medals at the finish line upon completion of their event! While age group results WILL be provided, this years event will NOT have age group awards. Results Both actual and adjusted results from Miller Race Management will be displayed at the event and will be posted at TRITOFINISH.COM within 48 hours of race completion.